I understand the need to stay cool during warmer months. When summer comes around, pick up your wardrobe staple—tank tops—from Monkey in a Dryer Screen Printing. We customize your tanks any way you want so you can have some serious summer style. Contact us today to learn more about our tank tops. We are based in Hopkins, Minnesota, and proudly serve all of the Minneapolis/St. Paul area and ship products to customers nationally and all over the world. With a relaxed fit and a longer length, you’ll be ready for the next important festival. 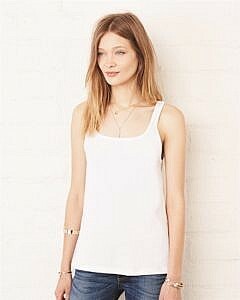 The new modern, relaxed fit and round neckline make this tank a must-have. Super soft budget friendly tank top for your group! Available in a bunch of colorful shades. A feminine version of the muscle tank that softly drapes around your curves. The modern elongated armholes and curved bottom hem make it perfect for layering. Go with the flow in this go-to tank, made from our exceptionally soft fabric blends. Flattering draped silhouette, round neck and racerback. Offered in a variety of solid, marble, neon and striped colors.